The Peerless Power of Comics! : As Doctor Druid Commands! 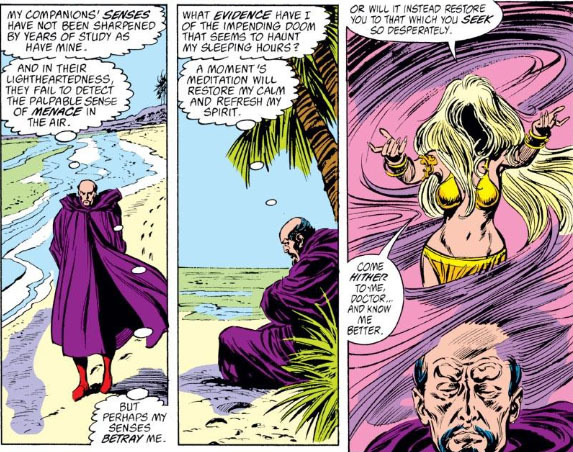 It was the mysterious Master of the Unknown, Doctor Druid, who played a part in the recovery of the Black Knight from the 12th century, conscripting the Avengers in a plan that also resulted in the Knight returning to his original body and free of the stone curse which the Enchantress had placed upon it. Hawkeye's parting words to Druid were less than cordial, due to Druid involving the Avengers without their consent: "Don't call us, curly--we'll call you." In hindsight, the team might have wanted to take Hawkeye's sentiments more seriously, given that it was Druid's actions that led to the dissolution of the Avengers under his later leadership of the team. 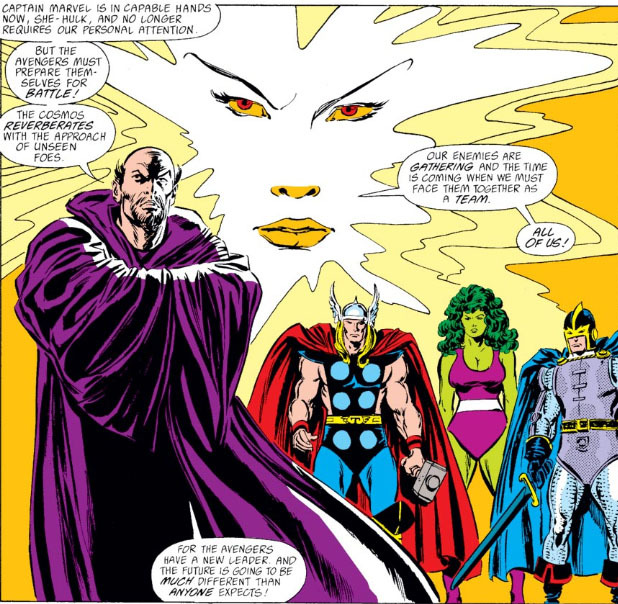 On the other hand, the Avengers were probably grateful that Druid had called on them fifty issues after their first meeting, when the Masters of Evil had laid siege to their mansion and had the Avengers at their mercy. Learning of the development from a news report, Druid took the opportunity to involve himself and repay his debt to them. It was Druid's involvement that was crucial to the Avengers turning the tables on the Masters, since Druid overcame Zemo's near-mindless puppet, Blackout, and thereby allowed the Avengers to penetrate the Masters' defenses and fight back. 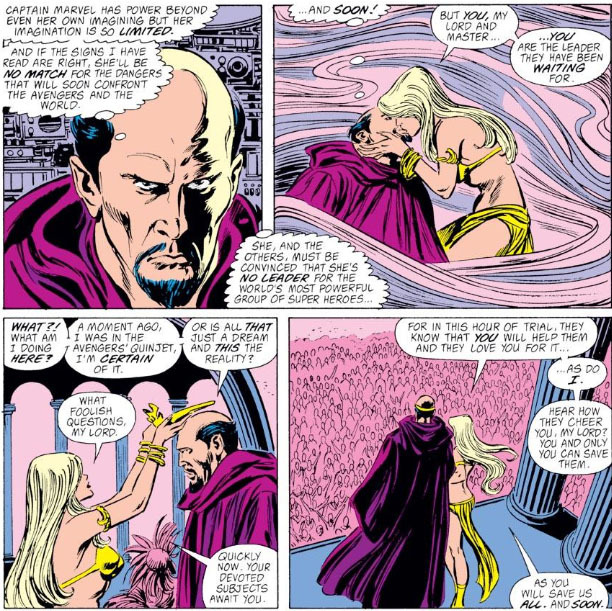 What happens to Druid--and to the Avengers--would hinge on both their continued development by writer Roger Stern and, unfortunately, his later departure from the book; and the point where things become complicated can perhaps be found in a pivotal scene involving Captain Marvel, a character that Stern created (with artist John Romita) and built from the ground up into one of the most exceptional Avengers the book had ever seen. 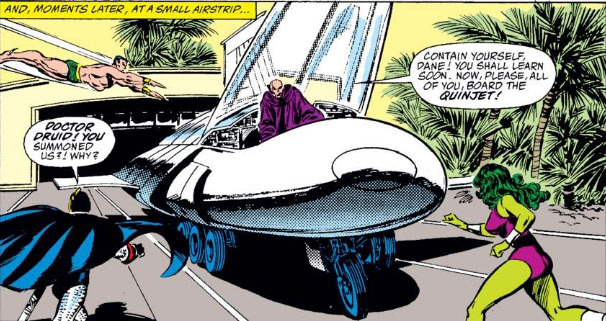 That scene began with the Wasp resigning her long and very successful chairmanship tenure, and continues with the induction of Druid as an Avenger; but the more important moment would be when nominations are made for a new Chairman, and Stern's plans for Captain Marvel come full circle. Reportedly, the direction that Stern takes the book in from this point became a concern for Editor Mark Gruenwald, who had a different approach he'd wanted Stern to take for both the Avengers and Captain Marvel. 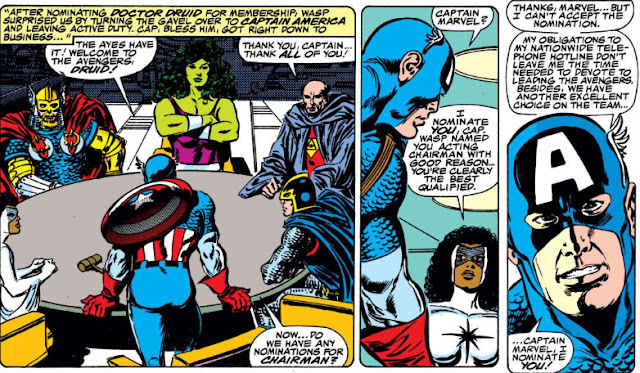 As we know, Marvel would eventually accept Cap's nomination and go on to distinguish herself as a strong, decisive leader of the team; yet Gruenwald had apparently wanted Marvel to come to the realization that she wasn't cut out for Avengers chairmanship, and pass the gavel to Cap. 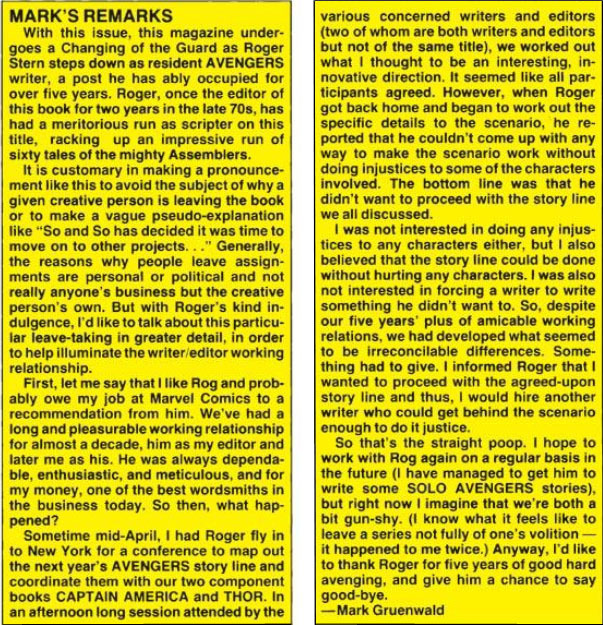 That led to a parting of the ways between Stern and Marvel, with Gruenwald correctly (if succinctly) boiling down the problem to "irreconcilable differences" between both men vis-à-vis the direction of the Avengers. 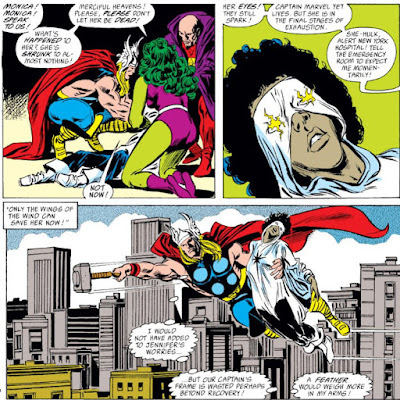 Stern's departure took place following the Avengers' return from Olympus, which occurred in the issue published in November of '87. 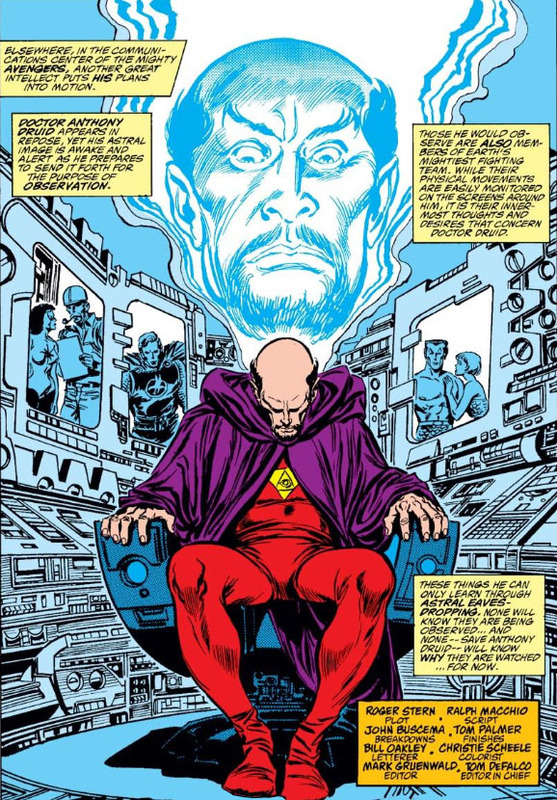 Given that Gruenwald's conference with Stern and the other writers/editors had occurred in April (the month which featured the Avengers issue where the team defeated the Masters and reclaimed their mansion, or what was left of it), we can assume that plotting was already months ahead and work on the Olympus arc was near its completion by that time. Obviously, Captain Marvel was headed in quite the opposite direction which Gruenwald had in mind--and Stern's objections to doing an about-face on her character, by this point in her long development, become easier to put in perspective. For what it's worth, Stern elaborates a bit on the subject in a later interview*, which doesn't go into specifics to any detail but serves as an example that there are two sides to every dispute. "I wound up at DC because I was fired from the Avengers and no Marvel editor was returning my calls. "No, I take that back, I did get one call. Jim Salicrup had become the editor of the Spider-Man titles and he called me up and offered me work on Spectacular Spider-Man. But this was right after Spider-Man--well, Peter Parker--had gotten married to Mary Jane Watson, which I thought was a huge mistake for both characters. So I thanked Jim and asked him to give me a call if and when that fell apart. "But I wasn’t disillusioned with Marvel, so much as I was disappointed in the place. I’d been working steadily for them for nearly twelve years, turning out stories that I thought were pretty good. The readership seemed to agree, and I’d never gotten any complaints from any of my editors. But then, suddenly, it was all over. "I’d disagreed with one editorial suggestion about the Avengers line-up. My editor wanted a change that I thought distasteful, and I sent him a memo to that effect. I would have liked to have discussed the matter further, but I was never given a chance. Instead, I received a message that I was fired. "And then, I discovered that my exclusive Marvel contract was pretty much worthless. Thanks to some wording in the fine print, I was required to deliver so many pages of material to Marvel in a given time, but Marvel wasn’t required to give me any assignments. An interesting Catch-22. Fortunately, the contract also had an escape clause, so I exercised it and went calling on Mike Carlin, who by that time had landed at DC." As for Druid, it's interesting to watch his development both before and after Stern hands off the reins to first Ralph Macchio, who then passes the baton to Walt Simonson. 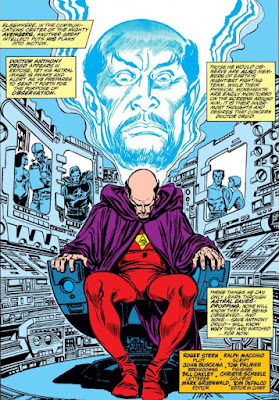 Druid was a fascinating character to watch while Stern was still at the helm, and he seemed to fit in quite well with the team; but it seemed clear as early as Cap's nomination of Marvel for chairmanship that Stern had something in mind for Druid down the road. Once Macchio began scripting (joined by Gruenwald at times), Gruenwald's plans for Marvel were jump-started, with Druid's off-hand comments and innuendo being the focal point for Marvel having doubts about her leadership abilities. And as Simonson stepped aboard, the process accelerates, with Druid's ambitions beginning to manifest thanks to his seduction by a strange woman who invades his dreams and stokes his ego and desires. Simonson's plot is nothing if not labyrinthine, with the mysterious woman's identity turning out to be an old enemy of the Avengers (et al. ), Nebula, who's involved with "the Council of Cross-Time Kangs," a group which for the sake of your sanity we'll table for another, er, time. Basically, Nebula seeks to maneuver Druid into becoming the leader of the Avengers, which would in essence place them under her control in order to assist her in penetrating a "time bubble" and gaining access to a Celestial weapon. Druid, in his haze, remains convinced of a deadly danger that only he has the wherewithal to lead the Avengers to battle. Nebula has corrupted him completely, though he remains ignorant of any duplicity. The Avengers are at this time involved in a struggle to save the Sub-Mariner's wife, Marrina, who has evolved to savage, leviathan proportions and is rampaging among the world's oceans causing death and destruction. At last, Druid gets the opening he needs to seize leadership of the Avengers, when Captain Marvel overextends herself in an attack against the monster and dissipates much of her mass in the process, benching her indefinitely and certainly rendering her in no shape to swing a gavel. 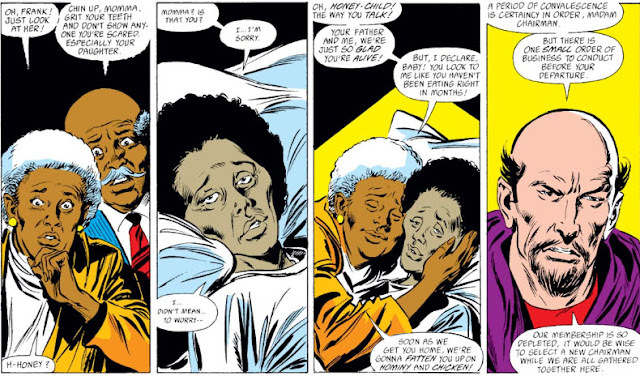 And when Marvel's parents are brought to her bedside, it provides the perfect setting for Druid to make his move. Almost shockingly, Marvel nominates Druid as Chairman, though it's clear that Druid has subtly prodded her choice--nor does Druid hesitate to similarly coerce the remaining members thus, though he fails with Thor but seems in the clear when Thor declares he will abide by the decision of the majority. The "ayes" have it--and at long last, so does Druid. Soon enough, Druid shows his true colors, yet with Nebula's help manages to enthrall both Thor and the She-Hulk and embark on the mission to the time bubble. Captain Marvel, of course, is history (as an Avenger, and perhaps as the character that she held so much promise in becoming)--and by the end of Simonson's run, all but one of the active Avengers that Stern had put in place would be gone. If you're still hearing Druid's words ringing in your ears -- "...the Avengers have a new leader. And the future is going to be much different than anyone expects!" -- well, he nailed that forecast, didn't he? Interesting post. 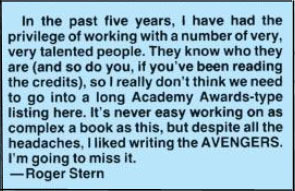 I was not aware of the circumstances of Stern's departure, but I had kind of lost interest in the comic at this point. It did seem like things were coming to some kind of an end. It was depressing! I remember somebody calling themselves Gilgamesh and somebody dressed as an egg, but that was it for me. I didn't like them making Doc Druid a villain; I liked that character ever since I saw him in the pages of The Incredible Hulk and thought he had loads of potential. It was sad to see him get suckered by Nebula like that. It seemed out of character for a guy whose powers were physical and mental self-control, but I guess love makes fools of us all. It wasn't Druid's finest hour, to be sure, M.P. I prefer to remember his time with the Avengers while Stern had them headed onward and upward. Druid balanced out the team well while avoiding blending into the background, and in such a high-profile group that was no small accomplishment. It all makes sense now. I recently read stern's runband loved Captain Marvel for how powerful a character she was. I never understood why she was destroyed like that. It's rare to see a syrong female character especially a black one. And her abilities made her one of the more powerful Avengers. Greunwald really screwed this one up. The title just went in a totally different direction and it wasn't a good one. Thanks for the info. It all makes sense now. So that's the story behind the deconstruction of Monica Rambeau aka Captain Marvel. 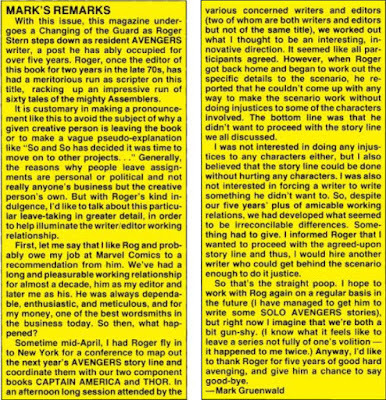 Roger Stern gaveth and Mark Gruenwald tooketh away. I wish Mr Gruenwald were still alive so he could explain for himself what he had against Monica leading the Avengers. My impression, NorRad, was that Gruenwald, who scripted Captain America for years, felt that Cap was more of a sales draw for readers in his position as leader of the Avengers--which would, in turn, trickle down to Cap's own title and translate to increased sales of that book. It's hard to argue with Gruenwald's decision from a business standpoint; on the other hand, for readers of both titles, there's the possibility that they're going to grow tired of too much Cap in the spotlight. The whole point of Avengers chairmanship is that it rotates from time to time, injecting new life into the book. Frankly, I felt that the Wasp leading the team would be problematic--but look how well it worked out for the duration of her tenure. Her style (and that of Captain Marvel) is very different from Cap's. It's unlikely that a new reader picks up a copy of The Avengers with the expectation of reading "Captain America's Avengers"--which, by the way, is not how the book's masthead is worded, with good reason. The Soul Of The Darkchild! Tune In For: The Death Of The Hulk! Return of the Leopard Lord! Have No Fear--Captain Ultra Is Here!